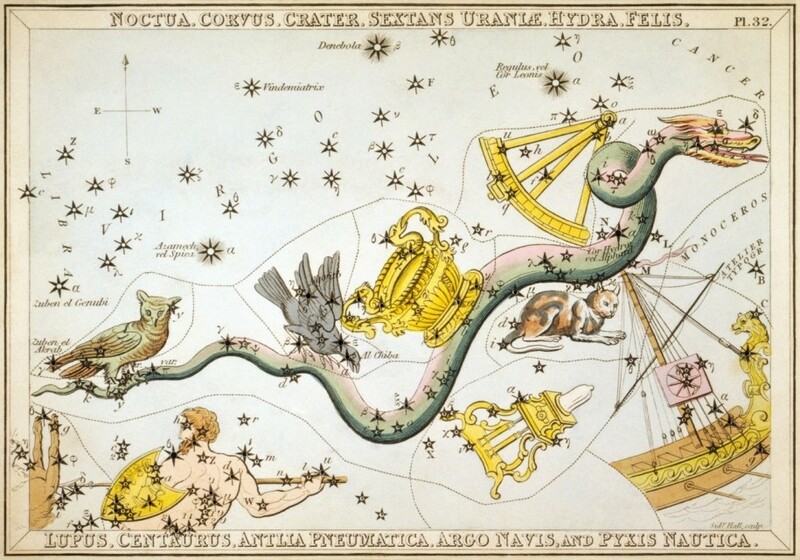 Constellation Hydra the Water Snake, is a southern constellation sitting under constellation Leo and constellation Virgo, and on it’s back sits constellation Crater, constellation Corvus, and constellation Noctua. 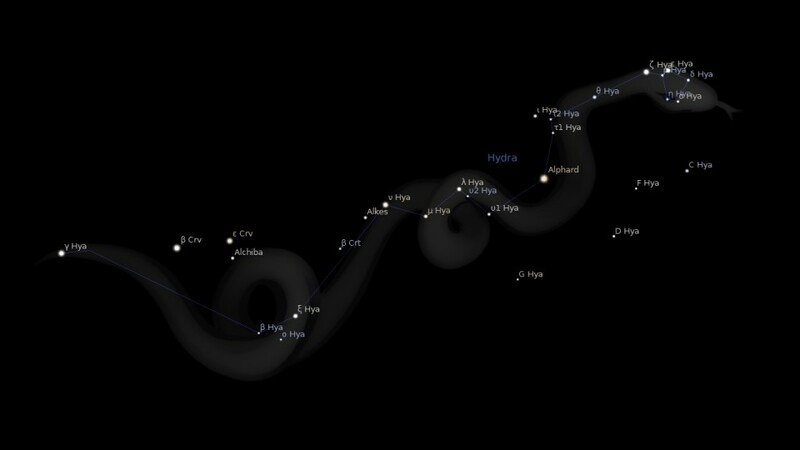 Hydra spans 90 degrees of the Zodiac, in the Sign of Leo, Virgo, Libra and Scorpio, and contains 5 named fixed stars. Hydra is supposed to be the snake shown on a uranographic stone from the Euphrates, of 1200 B.C., “identified with the source of the fountains of the great deep,” and one of the several sky symbols of the great dragon Tiamat. Certain stars near, or perhaps in the tip of Hydra’s tail and in Libra, seem to have been the Akkadian En-te-na-mas-luv, or En-te-na-mas-mur, the Assyrian Etsen-tsiri, the Tail-tip. Theon said that the Egyptians considered it the sky representative of the Nile, and gave it their name for that river. It is pictured as the female serpent (Hydra), the mother and author of all evil. Hydra has the significant meaning, he is abhorred! It is an immense constellation extending for above 100 degrees from east to west, beneath the Virgin, the Lion, and the Crab. It is composed of 60 stars; one of the 2nd magnitude, three of the 3rd, twelve of the 4th, etc. 1. Fixed Stars and Constellations in Astrology, Vivian E. Robson, 1923, p.47. 2. Star Names: Their Lore and Meaning, Richard H. Allen, 1889, p.246-247. 3. The Witness of the Stars, E. W. Bullinger, 40. Hydra (the Serpent).